One of Curt’s teammates emailed him mid-day yesterday, offering enough Caps tickets – FREE! – for our whole family for last night’s game. He called them “lower level seats”, and in so doing, displayed a unique gift for understatement. Two of the seats were ROW A ON THE GLASS – the section where you have to wear the special, plastic access pass. The section where you are someone – or have to know someone – in order to get those seats. (And despite that, they let us in!) Every time the players skated by, we appeared on the jumbotron. We were that close to the ice. The other three seats were equally fantastic – 100-level, row G, behind one of the goals. We had a great time – we mixed it up so everyone had a turn to sit in the first row and experience the NHL, up close and personal. Over in Row G, there were some serious, authentic-jersey-wearin’ fans. There was one lady, two rows behind us, who did not stop yelling LET’S GO CAPS! the entire game (except for the intermissions). My boys got the giggles over her incessant chanting. Also, there was this guy in the row in front of us, who was shaking this little souvenir teddy bear that was wearing an Ovetchkin jersey, as if the thing were a pom-pom. He was having a great time – all smiles – he appeared to be there by himself, just having a beer and enjoying the game. When the Caps scored, everyone around us was high-fiving, but that guy? 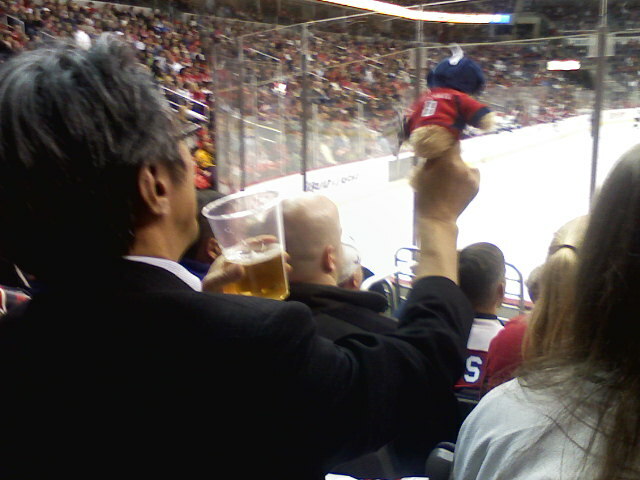 He turned around and thwap-thwap-thwapped my raised hand with his little Ovetchkin teddy bear! We got home late and tired and you know how much fun the next morning is when the kids are out way past their bedtimes. And of course, despite my fervent wishes, the Halloween gnomes were NOT crafting costumes for me while I was away. Still, it was a fantastic evening, the kids had a great time, so did the grown-ups, and it’s not every town where you can just pop on into an NHL game on a weeknight. That’s one reason why we love living here. Posted on October 29, 2008 October 29, 2008 by MegPosted in family, overextended family, sportsTagged Capitals, Caps, hockey, Let's Go Caps!, NHL. Way cool! Love the picture. Hee hee! Lucky. The one and only time I went to a caps game was nose bleed level seats. I don’t remember the game, but there was a lot of beer involved. Ooh, I’m so jealous. Great seats. CBW – Beer? You? Really? Hey other Meg! Great to see you again! – it really was a great game, besides being big fun to act like we were all kinds of important down there in the hoity-toity seats. The face value on the Row A seats was crazy – not money we would ever, EVER spend to watch pro sports, so that made it all the more sweet.